The Flying Scot is 19 long and weighs 850 lbs. Sailed by two or three people, the Flying Scot has 191 sq. feet of sail, consisting of a main and jib, plus a 200 sq. ft. spinnaker. The Scot has a high boom and wide decks. The Scot can be easily trailered. 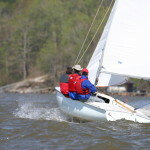 The Scot fleet hosts the Great Scot Regatta in the fall of each year. The Thistle is 17 long and weighs 515 lbs. Sailed by two or three people, the Thistle has 191 sq. ft. of sail, consisting of a main and jib, plus a 220 sq. ft. spinnaker. The Thistle can be easily trailered. 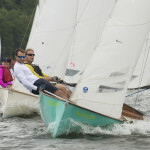 The Thistle fleet hosts the Great Pumpkin Regatta each fall.